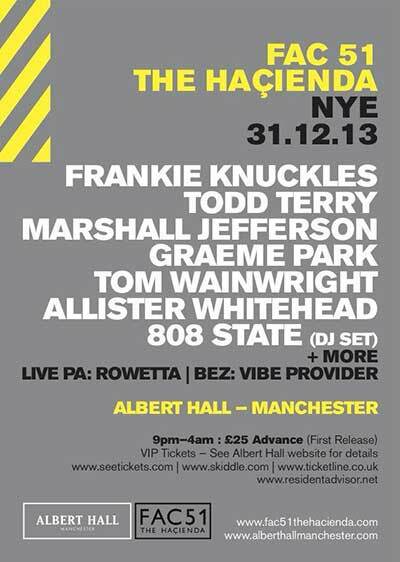 Tue:31:Dec:2013 - 808 State DJs - FAC51 The Hacienda NYE @ Albert Hall - Manchester - alternative flyer1 - alternative flyer 2. Tue:31:Dec:2013 - 808 State DJs - Fantazia @ Bowlers - Manchester - alternative flyer. Sat:23:Nov:2013 - Darren Partington DJ - Big Unit Aftershow Party - Odder Bar - Manchester. 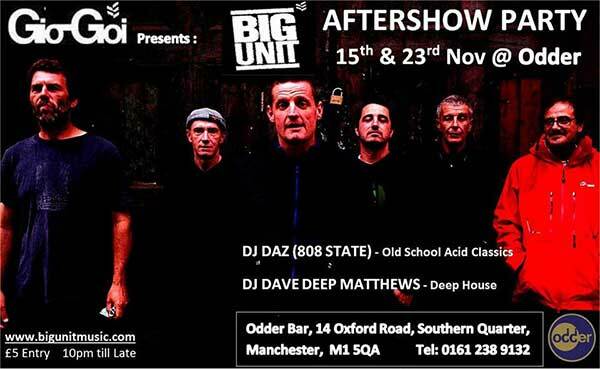 Fri:15:Nov:2013 - Darren Partington DJ - Big Unit Aftershow Party - Odder Bar - Manchester. Sat:09:Nov:2013 - 808 State DJs - Distrikt 7 - Leeds - alternative flyer. Tue:29:Oct:2013 - 808 State DJs - Palais De Tokyo - Paris - France. Sat:26:Oct:2013 - 808 State DJs - Halloween @ Unit - Tokyo - Japan. Sat:19:Oct:2013 - 808 State live - Madrid - Spain. cancelled! Sat:19:Oct:2013 - 808 State DJs - Solyanka Club - Moscow - Russia. Fri:18:Oct:2013 - 808 State DJs - Dom Beat - Saint Petersburg - Russia. Sat:21:Sep:2013 - 808 State Live - Incubate - Tilburg - The Netherlands. 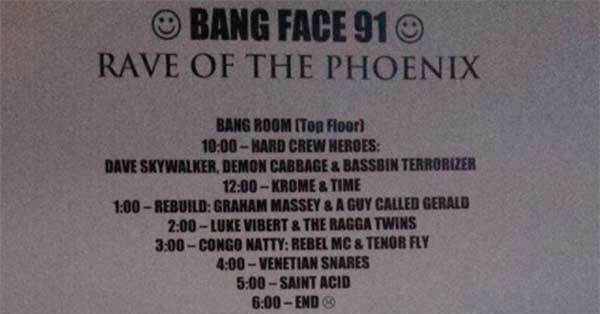 Fri:13:Sep:2013 - Rebuild (Graham Massey & A Guy Called Gerald live) @ Bangface - Electrowerkz - London. Fri:13:Sep:2013 - Graham Massey & A Guy Called Gerald live @ Bangface - Newquay cancelled! Sat:14:Sep:2013 - Massonix - Festival No. 6 - Portmeirion - Wales. Sat:07:Sep:2013 - Graham & Gerald live Rebuild @ Retro Acid - Vooruit - Gent - Belgium - Alternative Flyer. Thu:05:Sep:2013 - The Part Time Heliocentric Cosmo Drama After School Club (Graham Massey) - Levenshulme - Manchester. Sat:31:Aug:2013 - The Part Time Heliocentric Cosmo Drama After School Club (Graham Massey) - The Kazimier - Liverpool. Sat:31:Aug:2013 - 808 State DJs - Bez's Acid House - The Granary - Kilmarnock - Scotland - alt flyer. Fri:16:Aug:2013 - 808 State DJs - Carsons Sports Bar - Manchester. Sun:11:Aug:2013 - 808 State Live - Betley Park Farm - Betley - Crewe - Cheshire. Sat:27:Jul:2013 - 808 State DJs - The House Party @ Kendal Calling - Lancashire. Fri:19:Jul:2013 - 808 State DJs - Made Of Stone Film Screening - O2 Academy - Sheffield. 28-30:Jun:2013 - 808 State DJs - Glastonbury Festival - Somerset. Sat:22:Jun:2013 - 808 State Live - Scarborough Open Air Theatre - Scarborough. Fri:21:Jun:2013 - 808 State Live - Coronet - London. Tickets. Sat:15:Jun:2013 - DJ Darren Partington - SWG3 Warehouse Rave - Glasgow. Sat:01:Jun:2013 - 808 State DJs - Bez's Grand Acid House Ball @ Hendre Hall - Tal-y-bont - Wales. Thu:30:May:2013 - 808 State DJs - Barca - Manchester. Thu:30:May:2013 - Massonix @ Interpretations on F.C. Judd - Islington Mill - Manchester. Sun:26:May:2013 - 808 State DJs- The Brighton Centre - Brighton. Sat:25:May:2013 - 808 State Live - Vegfest - Amphitheatre - Bristol. Sat:5:May:2013 - 808 State DJ's - Sankeys - Manchester. Sat:27:Apr:2013 - 808 State Live - Hacienda festival - Oiso - Japan. Sun:31:Mar:2013 - 808 State DJs @ O.W.A.P. - Gashouder - Amsterdam - The Netherlands. Fri:15:Mar:2013 - 808 State DJs & MC Tunes - Antwerp Mansion - Manchester - England. Sat:02:Mar:2013 - 808 State DJs @ Tokyo - Hull - England.